Perhaps it was the St. Johns River, the warm climate, and the orange groves that lured William Lambert Dorr to Federal Point some time before 1866, after serving in the Civil War in the Union Army. He purchased land from Folsom and Tenney in 1866 and in 1874 he purchased another 100 acres. 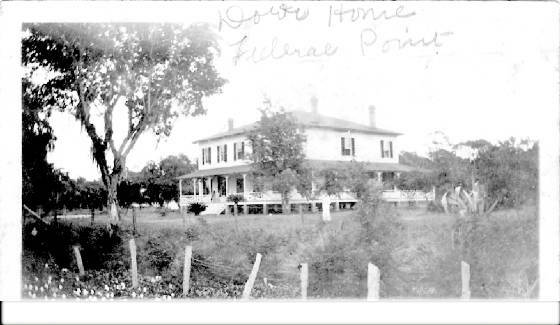 At one time, William and wife, Lydia Moore Evans Dorr, (born July 1845 in Virginia) owned over 450 acres along the St. Johns River at Federal Point, which was originally a part of the Pedro Cocifacio Grant. Their home and land was adjacent to Lydia’s brother, William A. Evans, on Federal Point Road. William Lambert Dorr was born July 1844 in Ann Arbor, Washtenaw, County, Michigan. He was a descendent of the prominent Dorr family who came to America and settled in Massachusetts around 1670. William was the son of Nathan Hayward Dorr and Sarah Hoyt Dorr (born in New York). In the 1860 census of Washtenaw County, Michigan, William and brother, George Nathaniel Dorr, are living with their mother and her husband, Ezra M. Crosby. Apparently, William and George inherited $40,000 from their father’s estate, as each have $20,000, as shown in this census. In 1886, William served as Justice of Peace. He was instrumental in forming the St. Pauls Episcopal Church and served as Junior Warden and Secretary and Treasurer. He was a member of the Federal Point Literary and Social Club. In the 1870 census of Federal Point, William is 26 years old and farming next door to his future brother-in-law. In 1872, he married Lydia Moore Evans. In the census of 1880, William is listed as an orange grower. In 1896, William and Lydia sold 410 acres to Lydia’s sister-in-law, Kate M. Evans, wife of William A. Evans. In 1908, William and Lydia sold 25 acres to Lydia’s brother, Thomas D. Evans. William and Lydia had no children. William Lambert Dorr died December 13, 1908 at Federal Point. Two years later, Lydia died on November 26, 1910. In William’s Last Will and Testament, he left his nephews, William Lambert Dorr and David Nathan Dorr, of Dunnellon, Florida, who were children of his brother, George, the orange groves and wild lands at Federal Point. At Lydia’s death, the remaining estate was bequeathed to her sister-in law, nieces and nephews.